Mix in these rainbow sprinkles and enhance your fun and festive baked treats with all the colors of the rainbow! Perfect for a consistent product that's sure to please all of your patrons time and time again. These sprinkles will put the finishing touch on all of your most popular dessert creations, from cupcakes to soft serve ice cream, and so much more. Tiny, thin, and rod-shaped, these sprinkles add unique texture and brightly-colored decoration worthy of any passerby's attention to all your sweet dishes. An extremely versatile, must-have ingredient for your ice cream shop, bakery, or diner, this 25 lb. bag of sprinkles will keep you in good supply. While the sprinkles themselves were a good variety of color and the texture was good, they arrived with cuts or tears in the sides and bottom of the bag. It was difficult to get them out of the box without spilling more. Thank you for your feedback! We are sorry your Regal Foods 5 lb. Rainbow Sprinkles package was damaged. Corrective action has been taken and a Customer Solutions Representative will reach out to you shortly! Love that all of the colors are mixed in! I've got them before from other companies and they do not have all of the colors. These also taste great! Very pretty,classic birthday sprinkles! Great for cupcakes, cakes, etc. We love them!! side note- Be prepared to store them in an airtight container as they do come in a thin plastic bag inside the box. If you need a huge amount of rainbow sprinkles, this is the route to go! We use them as toppings for donuts, ice cream and caramel apples. Always a crowd pleaser! Regal foods Rainbow Sprinkles are a great choice as an ice cream topping. The kids always ask for sprinkles on top of their ice cream and they love it. For our ice cream shop rainbow sprinkles are a must have. All the kids want rainbow sprinkles. Some of the other brands have been stale and chalky but these taste pretty good. 25lbs of Rainbow Sprinkles that hold strong in batter and ice cream without dissolving or “bleeding” color. These sprinkles are vivid assorted colors for all your sprinkle needs at an AMAZING value compared to stores and other supply houses. Sprinkles are one the most popular toppings at our frozen yogurt shop. WebstaurantStore has the best price for the amount that you get. They are pretty colors and taste as expected. I love these rainbow sprinkles! They are colorful and work great for my decorated sugar cookies and even when making a funfetti flavored cake! Thank you!! These are the perfect colored sprinkles to use for any unicorn themed type dessert! The colors are so cute and vibrant and adds a great pop of color to your desserts. Everyone loves sprinkles, these are a great size, vibrant in color and a bargain at that...great price, no spillage or messes inside the box, no damaged boxes in shipping! I use a lot of sprinkles on my cupcakes, and recently started doing cookies, and using them on those as well. I love the variety of colors in this rainbow sprinkles mix and have been very happy with them. The kids love these sprinklers on their ice cream. They are not just colorful but nice presentation when adding the different syrups from Webstaurant store. We purchased the 5lb option to test these out, and then immediately after purchased the 25lb option. The picture makes the sprinkles look chunky, but these are in fact your traditional rainbow sprinkles. They came in a bag and shipped in a box. Super colorful sprinkles that taste amazing and children love! Excellent price that will be hard to find anywhere else... haven’t had a problem with keeping them fresh... just keep covered when not in use. its just so cute! if you're a baker this the right amount of boba for such a good price. the sprinkles are good and never come melted. These are good rainbow sprinkles with all the right colors. Some others that I have purchased don’t have all the colors so I have to add extra colors which is annoying. These are good. These sprinkles are on the large side of the spectrum. They also tend to melt in the oven and will smear if you touch it while hot. To avoid this you need to let cookies or candy cool completely before touching. I Love these Sprinkles. The price is Great for 5lbs. They go great with my cupcakes and Cakepops. Everyone Loves Sprinkles, especially the kids. I will definitely order again! Very pretty sprinkle, but leaves a horrible after taste. They look really good on the product but the taste is not what you want. May be good for baking, but wouldn't recommend being used as a topping. Needed sprinkles for an ice cream bar at an upcoming wedding. Buying small bottles of sprinkles was getting ridiculous. Found this 5 pound bag for a fraction of the price of lots of the small containers. Sprinkles for everybody for a long time. Love it. 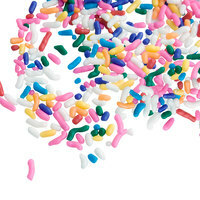 The Regal Foods 5 lb rainbow sprinkles are not only tasty but also durable. They dont crumble or melt into a blob of messiness. Theyre the perfect sprinkle! Regal Foods has been making respectable ingredients and spices for a long time, however, once these arrived i noticed a small tear in the bag. Instead of a shiny coat on the sprinkles, it was more of a dull color. I am not sure if this was a result of exposed air and heat or that is the way they were supposed to be. Either way, I served then last night and the kids complained of an after taste and film residue in their mouth. Ive ordered many before that were just perfect, maybe we received a bad batch, but i will ditch these and see about ordering another box. Overall, I can say that the sprinkles are priced excellent and generally taste good; but we were out of luck with this batch, but i do not think it was any fault of Webstaurant. A great buy on rainbow sprinkles and we use them in all sorts of ways at our sweets shop. They are great for decorating waffle cones and candies and are the key ingredient in our Birthday Cake ice cream. They are wonderful. I love these sprinkles!!! they are such an amazing price and great quality. They never leave streaks of dye in frosting or batter and have a great flavor. Rainbow sprinkles! Love them! They a good non waxy texture! They taste like sugar, so that's always good! They are very bright. We use them on sugar cookies and cakes! These sprinkles look great unfortunately ours came with the bag broken open so they were not any good for us to use. They are a good size and have a good taste. They should pack a little better though. We appreciate your feedback! We’re sorry this came broken! A Customer Solutions Representative will be contacting you soon. A great quality box of rainbow sprinkles that is perfect for garnishing an array of baked goods like cookies or cakes. A great assortment of fun colors and they are quite tasty. These get the job done for my funfetti batter!!! Perfect sprinkles and can also be used for topping cakes and cupcakes! They come in great condition so you won’t have to deal with broken mushy sprinkles! Sorry but we received numerous complaints from customers saying the sprinkles leave a film in their mouth. Tried them myself and had to take a napkin to wipe the film stuck to the roof of my mouth. Thank you for your feedback! We are sorry your 25 lb. Rainbow Sprinkles were defective. Corrective action has been taken and a Customer Solutions Representative has credited your account. These sprinkles are great, just be sure to keep them in a cool or temperature controlled spot. When exposed to warmer temperatures they start to clump together. Great quality sprinkles with a good flavor. No bad after taste. Awesome price on webstaurantstore compared to other stores and sites. They also arrived fast! Great sprinkles! Color are so very vibrant, they taste great, sweet and creamy. Work perfectly for my funfetti cupcakes and cakes, both inside the cake and sprinkled on top. Family loves these for their ice cream sundaes! The 25 lb. Rainbow Sprinkles arrived promptly and was well packaged. The quality of the rainbow sprinkles was colorful and tasted fresh. We would recommend it. The sprinkles themselves are wonderful and the pricing is even better. However, two of my bags came with holes in them. Websteraunt was quick to respond and after a few photos shipped out two replacement bags free of charge. Great service and a great product. We use these Regal Foods Rainbow Sprinkles very often at my cafe/creamery and they add the perfect touch to our ice cream! I would definitely recommend this product. WebstaurantStore always has fast shipping and is consistently reliable! Ordered these so we didn’t have to order a bunch of small containers. Great sprinkle colors and fast shipping. Can’t wait to use them on our waffle bar. These sprinkles are yummy! I use them to make cookies, put on ice cream and so many other treats. They have a perfect texture. I'm very satisfied with my purchase! Love the colors! Sprinkles were bright and colorful! Not to mention being a great product but it was shipped quickly and in extra packaging to make sure it didn't arrive damaged. These sprinkles were perfect for the huge ice cream party that I had for my graduation party. It was fun to also open a huge box of sprinkles. I felt like a kid on Christmas morning. Unlike some reviewers, the sprinkles I received were pretty true to the photo(s). Good variety of colors, very bright, and kept their shape/color even when baked into cake batter and cookie dough. If/when I run out, I know where to turn! I have a six year old that lives on sprinkles. I am not kidding. She puts sprinkles on everything. These are the best jimmies. They are bright, fluffy (not the thin anemic hard jimmies found elsewhere) and stay bright when baked in cake, brownies, cookies, waffles, breads, fritattas, omlets, grilled cheese (I warned you). Best price anywhere! I love these sprinkles. So much better than what I was previously ordering from another company. The colors are very bright and vibrant. I also like that the sprinkles are not hard as rocks. Love these sprinkles and that you can buy in bulk fairly easily. The only thing to make this a perfect purchase would be if there was a scoop included so you could easily transfer it to the storing container. Other than hat a great buy! Rainbow sprinkles are a must in an ice cream shop! These are a great quality with vibrant colors, and the price is spot on too. We also use them to top cupcakes, on our chocolate dipped treats and to top our birthday cake milkshakes. Sprinkles make everything better. This is a classic colored sprinkle mix that we use weekly in our Funfetti cake batter and as decoration. The colors are bright and festive! I have ordered sprinkles before but this batch I received was very dull in color and not as vibrant as the last box. It tasted ok. The rainbow sprinkles are excellent and a great item to top our donuts and other pastries for a fun look. A great topping for kids and excellent price for our bakery. Great value on these sprinkles. Great flavor, no complaints, pretty colors, they all arrived loose and not melted which is awesome! We go through tons of theses a day! Our customers love these rainbow sprinkles. We use them for our sundaes and to top milkshakes and ice cream. They are colourful, taste great and the price is good. My daughter is starting her baking business. This amount is great for coating cakes and cupcakes with sprinkles. The price is great for the amount you get. We are very happy with the taste and quality of these colored sprinkles. We use them Gourmet caramel apples and our customers love them. We highly recommend them. I just got the 5lb bag of rainbow sprinkles and I love putting them on my desserts. A little sprinkle on your ice cream can make it look and taste great! Webstaurant has the BEST sprinkles!! Brightly colored. Don't fade on the other food. Good size. I hate wimpy sprinkles and these are fantastic! Highly recommend. I have ordered over and over again for our ice cream shop. This box of sprinkles is huge! If you are a place that serves ice cream, this is your box! I just bought them for desserts, and I will have them forever. I decided to buy this case of rainbow sprinkles instead of the 5 lb version and we saved a ton of money. These are really good! I make a lot of funfetti cakes and cupcakes and these sprinkles hold up very well in the cake batter and during baking. Highly recommended. Rainbow sprinkles bring back childhood memories and are great for topping ice cream and other desserts. I love the assortment and they were great on our ice cream topping bar. My kids love these sprinkles. They are very colorful and vibrant. The best quality for this quantity and it is a must if they are having sundaes. Rainbow sprinkles bring a colorful sweet touch to so many treats! Perfect for cakes, cupcakes, and cookies! 25 pounds goes a long way and it is a great price! The Regal rainbow sprinkles are such an amazing quality and perfect for our birthday cake cupcakes. They are colorful and kids love them. A great quality and texture sprinkle. Love them. Great Price to get the 25lbs. I wold only suggest if you are getting other items- otherwise shipping is a lot. I mean it is 25lbs! Sometimes the colors are faded with the sprinkles from the site. But it is not their fault - more from the distributor. We do lots of frozen drinks at our coffee shop do it's always fun to have these in hand for when the kids get something. I love sprinkles and this large bag is perfect! The colors are pretty and vibrant and will look great on anything from cookies to cakes and everything in between. These coloured sprinkles adds life to sundaes and birthday cakes. The kids love it on their ice creams and in cookies. I highly recommend this product because of the good quality and taste. I don't know if it was just the batch of sprinkles that I received, but I was a bit disappointed in the color ratios. It seemed mostly reds, oranges, and yellows, and barely any greens, blues, or purples. It did look pretty festive and bright, but just not quite as rainbow-y as the picture. The sprinkles also look a bit "dusty"...these sprinkles are the chalkier kind, and so when they rub against each other they start breaking down into a fine dust that very slightly dulls the colors. I'm a perfectionist though, most people probably wouldn't notice. It's hard to complain at this price, at any rate. You can never go wrong with the classic and fan favorite rainbow sprinkles. They are always going to be a hit on any ice cream bar. Our customers love them and so will you. A nice array of colors in this box of rainbow sprinkles. The sprinkles are a great quality and really nice for decorating birthday cakes and cookies. We have ordered these multiple times now. We haven't found better quality for a better deal anywhere else. They are bright and nicely colored sprinkles we us for our ice cream. What can I say.... It's Sprinkles!! My whole family loves rainbow sprinkles. Usually I can only find them in small containers, so I was thrilled to buy this huge box of rainbow sprink!es. Now, we can eat as many as we want without worrying that we'll run out of them. The colors are bright and lots of fun!! I repackaged them into quart jars for easier storage, but they could have been kept in the original shipping box as it's lined with a heavy plastic bag. These are a tasty addition to cakes, cookies, puddings, ice cream and more. Not to mention, they are delicious right out of the box!!!!! The rainbow sprinkles are a great value and I am very happy that I made the purchase! A great addition to our Ice Cream topping selection menu. Adults and kids love adding these rainbow sprinkles to their ice cream treats. Food cost price to serving price is outstanding. Who doesn't love sprinkles?!? Whether it be on icecream, cookies, cakes or cupcakes... You can never have too many. We go through tons of sprinkles when we do our famous sprinkle covered cakes... for the price you can't beat it. Not even locally where I'm at. Webstaurant always comes through. I use these sprinkles every day at our bakery. They are so colorful & work well on top of the cupcakes, as well as in the batter for funfetti cakes! A great quality sprinkles that are great for garnishing ice cream. My kids love these sprinkles and they are great for decorating sugar cookies. as well. I love my rainbow sprinkles and I sell them like crazy! Everyone adores their sprinkles and how pretty it makes their shakes look I couldn't imagine life without them! Gummy Bears make great toppings for shaved ice and ice cream. Plus you can also charge customers a small fee to add Gummy bears to their favorite dessert. Just what we needed for sprinkles at a pretty good price. The colors are vibrant and has a good variety. The sprinkles are a good size and taste just like you would expect. It goes perfect for all our baked goods needs. yummy tasting sprinkles. I own a bakery and we use these for everything and all my customers love them. ADVICE: make sure you keep in a sealed container to avoid taste alteration! This is a huge amount of sprinkles for the price! They look great on iced cupcakes. I deducted one star because it looks like the pink sprinkles have 'bled' a little bit onto some of the white sprinkles in the mix, but for this price it isn't a deal breaker. I love these sprinkles on ice cream and frozen yogurt. They add such a fun pop of color and make the ice cream look that much more appetizing. Rainbow sprinkles continue to brighten up a variety of our ice cream products. They are a customer favorite particularly with children. These are fresh and do not clump. They look and taste great on our desserts. The make our ice cream sundaes look amazing. They look great on the mini and regular sized cupcakes. Kids and adults alike enjoy them very much. One of my best selling cakes is covered with these sprinkles. They are also great mixed in cake batter and cookie dough. So colorful and festive! These are great looking sprinkles! The pricing is very competitive compared to other vendors. We are very happy we found that Webstaurant sells this sort of product! Cant go wrong with sprinkles. will order again. the packaging itself is nice. doesn't come all broken. it as fresh and taste great. easy to store and last long. we bought this larger size and smaller size packaging. Sir Clean recommended this product 25 lb. Rainbow Sprinkles, the colors are nice, the kids love it, the price is really good, it's perfect in ice cream or different kind of desserts. Good small size. Good to use with anything. Good for icecream toopings or to make waffle cones. Great for small kids. Good quality rainbow sprinkles. This is a great product at a great price! These sprinkles hold up well in the oven, and do not melt. They also hold up well when we portion and freeze sprinkled cookie dough. A versatile product! This Regal Foods rainbow sprinkles are great. The colors are nice and vibrant. No fade out colors here for sure. They are so versatile, we use them as topping in almost every thing. And the price for 5 pounds is great as well. Great sprinkles and they worked perfectly to cover the cake I needed to make. The kids love them on ice cream! There's a lot for a great price so I won't be needing to buy more for a while. The rainbow sprinkles are colorful and shiny. Much better than those purchased elsewhere. We use them on some of our fudge as a colorful topping. Really grabs kids attention! These are awesome sprinkles. They are the classic rainbow sprinkles everyone grew up with. They look nice in funfetti cakes and on ice cream desserts. I have had these in the past as one of my friends had bought the 25lb. of rainbow sprinkles. They are very colorful and fun to use for cupcakes, cakes and pastries alike. They had an extra kick of sugar and worth the cost. I use rainbow sprinkles multiple times a week while working on cakes and cakepops, and honestly, the easy of use and pricing of this 25lb. Box of rainbow sprinkles. I bought a cheap candy jar to put some of the sprinkles in at a time, and then store the rest of the box in my office, I will never buy sprinkles from anywhere else, such a great experience (fast shipping, the container was hygenically sound, the price point is unbeatable) I just love it! OH. My. Gosh. These are WAY cuter in person than this photo shows. Bright colors, a little larger than standard sprinkles, TONS of character! We instantly fell in love with these when we saw them! Every kids dream and a must have topping for ice cream! They arrived well sealed in a small cardboard boxed container and creates an easy solution to storing. We were able to break them down with ease in smaller sized serving bottles. Honestly, i ordered these sprinkles and was skeptical of how the quality would turn out because the price was almost too good to be true. I am in love with these sprinkles. I use them for my birthday cake flavored macarons and they look wonderful. Who doesn't like sprinkles on their food? This is a good sized bag and the sprinkles are very good. They work well as a topping on desserts. these are the most requested and purchased sprinkles at my frozen yogurt shop. customers love them as a topping and i love the price. they cannot be beat. Great Price for sprinkles! We use them ALL the time!! From cookies, to cupcakes, to cakes, everyone loves sprinkles!! This type is great for cupcAKES! So happy with this!!!! I have been spending the same amount of money on 2 pounds of sprinkles locally. They look exactly the same and are 5 pounds instead! Came quick too! What a Great for all my baking needs! Love the amount of Rainbow Sprinkles for the price.. Great price for whole 5 lbs of Sprinkles. The color of these sprinkles/jimmies is bright and vibrant. They have a great taste and texture as well. For such a shelf-stable product, it is worth stocking up on these and saving a ton of money! These sprinkles are vibrant in color and very fresh. They smell and taste like buttercream icing. These are nothing like the waxy flavorless sprinkles in the grocery store. Simply cannot get enough of these! Cookies, cakes, cake pops! Kids love this fun color mix and its always a hit. I use them so much I'll be reordering soon! I use these to decorate homemade donuts at my business. They color is great and the taste is perfect. This is also the best price you will find online for sprinkles. These are great. We use them in our individual birthday cakes .. our guests are just tickled when we bring out a little cake for them on their birthdays.. these sprinkles make them look so nice.. This is a huge bag of rainbow sprinkles. They are pretty and taste great, but note that there bright colored, and unlike the store rainbow sprinkles, there aren't any chocolate ones in the mix. These are great tasting sprinkles at a great price. The have great colors and are not super hard. I will be ordering them again. No complaints. Love large size of sprinkles since you tend to go through a decent amount especially with things like ice cream. Everyone loves sprinkles, great buy. What a great product! The sprinkles are so vibrant in color and showcase my product perfectly! The amount is excellent for how often I need to use them on my cupcakes! I love sprinkles ! This is a great price for the amount of sprinkles and quality you get. Definitely recommend for any bulk sprinkles ! So many sprinkles! A great buy and great quality. When doing large coating jobs it's great to have an over abundance. Love having these in the kitchen. Well Packaged. Got tired of running out of sprinkles so we got this 5 pound bag. The colors are bright and they taste good. They make cakes pop out with fun colors that grab people's attention. I don't buy any brand of sprinkles, this is the best so far! I love the colors and how versatile it is, ice cream, cakes & more! These are perfect to sprinkle on my cupcakes!!! Kids definitely LOVE them. I also add them to my cookies and they come out great!! Great size for the price! Kids love these. An absolute must in the ice cream business. The profits made from this product alone as a topping (nominal extra charge) make them a deal. This a great price/size for Rainbow sprinkles. it has multiple uses from cookie, cupcakes or cakes. It can be used for toppings or even mixed into the batter. Excellent value for bulk sprinkles. There are different variations of sprinkles and textures, and was not sure which variety this was going to be when I purchase. I usually prefer the crunchier Jimmies, and still use those for certain products, but these softer sprinkles have more of a royal icing texture, which work really well in baked goods, like cookies and cakes. These are great to sprinkle on ice cream or cupcakes, to put in cake batter, and to cover an iced cake for a party cake. I love using these jimmies to decorate cakes but what are use the mostly for is for funfetti cake. They are great colors and what I like about it is that you don't have any brown in the color mix which you tend to find if you buy the jimmies at a grocery store. It's a great price for the amount of sprinkles that you get I have a recommend them. I always thought sprinkles were sprinkles but was surprised with the taste and texture with these. Our customers love them and a good item to have to add to your menu. These are great, not too gritty. The sprinkles have a nice consistency and work well to top both iced cookies or using as a sundae accompaniment. How fun are these colorful sprinkles! They are perfect for icecream, cake, and more! I love the bulk size and the affordable price. Great product. So much sprinkles... these are tasty, good quality, and colorful. I used them for my boyfriend's birthday cake, where he requested a funfetti type sort cake. I've also used them for decorating sugar cookies. Rainbow sprinkles have an even mix of the different colors. Good taste and not too strong as to overpower the taste of the item you are putting them on. I like how these come in a bulk bag and it saves a lot on waste. They taste fine and this saves me a trip or looking for these. You cannot beat this value. I spend more at a grocery or specialty store for a fraction of these sprinkles. they taste great, and work well as a topping. I intend on using them to make funfetti cakes, but I haven't done it yet. When I do, that will be the video I post! We are always looking for a good product for ice cream toppings. Regal Sprinkles fit that bill perfectly. Reasonably priced, fast shipping, and tastes great. For an ice cream shop, buying sprinkles in bulk is really the way to go. It's easier to see when we need to order more; no more weekly trips to the store. Most Sprinkles are similar in taste and color. You will like the Regal Sprinkles. They taste the same and have vibrant colors. The Regal brand is cheaper than the other brands of Rainbow Sprinkles and are not even close to the quality of Regal. Great for topping Cookies, Ice Cream and Cakes. A sundae bar would not be complete without rainbow sprinkles. Not only are they a classic sundae topping, but they add a pop of color to enhance the overall presentation. These sprinkles are great! This is a great product for an affordable price. Its restaurant quality! I will definitely be ordering again soon for my bakery. The customers love it! I love these sprinkles. I use them a lot for topping off cakes, cupcakes and cake pops. They come with a good proportion of each color, so there's not too much of a certain color of sprinkles. I'll definitely be purchasing more when I run out, which at this rate could take a while. The bag is huge! Typical sprinkles you would find anywhere, but Webstaurant offers them at the best price. Colors are very vivid and nice. It doesn't taste sweet or anything. This is my second time ordering this product. Both times, the bag containing the sprinkles ripped, allowing sprinkles to escape. The first time I ordered them, there were bits of sprinkles all over the rest of my products (easy enough to brush off). This time, most of the sprinkles were contained within the box that holds the sprinkle bag. That said, the rainbow sprinkles are nicely colored and taste good. The amount you get fills up a size #10 can mostly full. I can't say how much I LOVE sprinkles. So I have ordered 10 pounds of this stuff and it goes so quickly. It is a great deal and perfect for cupcakes or making funfetti cake. Kids love rainbow sprinkles on their ice cream. Add these to your ice cream cups or cones to make them more appealing and adds profit to your business. Love ordering sprinkles in bulk. We use these for decorating cakes, cookies, and a variety of baked goods. Goes great with our soft serve ice cream during the summer. Will be purchasing again for sure! Kids absolutely LOVE these Rainbow Sprinkles from Regal Foods. We thought 5lbs was a huge bag but kids eat them so fast we cant keep them in stock long. These will have to be bought in bulk quantities from now on because they are so good. Huge bag of sprinkles for a great price ! You will never run out of it. Great on cupcakes and ice creams or add a colorful rainbow on your cake. I used to use another brand but these are much better. some of them seem to be a little to crunchy though. For the price, these are great. I loved these sprinkles! I was so tired of constantly running out of sprinkles and having to make trips to the store for more. They do not bleed in the batter which is great and add wonderful color. These are so great! We order them all the time and use them for all kinds of recipes. They are a great size and always come fresh. But fade when in sun. Massive bag of sprinkles. These work perfectly for all sorts of desserts that I make. Such a great deal on a large quantity of colored sprinkles. I use these for my birthday cake cupcakes (bake the sprinkles inside), decoration for various desserts such as truffles, and especially, on our homemade ice cream cakes! YUM! I absolutely LOVE these sprinkles. The colors are very bight and vibrant. No dark or brown sprinkles which is great when used for funfetti cake! these rainbow sprinkles taste great.they are great for putting on cake or cupcakes,and sometimes brownies.i also like how all of the sprinkles are not the same shape. VERY pleased with this purchase! The sprinkles are good quality and the colors are so vibrant. They will make my sprinkle cookies look that much more delicious! Where else can you get 5 pounds of sprinkles at such a reasonable price?? Some other reviewers had mentioned problems with packaging and sprinkles that had spilled out of the bag. Mine were fine...no problems at all. I transferred them into another airtight container for convenience and to be sure they'll stay fresh. Don't hesitate. Great buy! Sprinkles, sprinkles and more sprinkles! If you need a lot of sprinkles, this is the deal for you! Large bag that was easily divided for our camp ice cream parties! I really like these sprinkles, we have ordered them twice. The 2nd time we received our shipment, the bag was busted. So, I called and another shipment was sent, and the customer service was great! We received the 2nd shipment, and again the bag was busted. I called and again great customer service, but we chose to get a credit instead of ordering more sprinkles. Hopefully you will rethink the packaging, I will try again in a few months. Thank You! These were pretty standard sprinkles, they tasted good and there was nothing wrong with them. They looked very good on our cupcakes and cakes. Will buy again! Is there really anything bad you can say about sprinkles?! My answer, No. I love these Regal Foods Rainbow Sprinkles - 5 lb bag! Rainbow Sprinkles come in a 5lb bag that is inside a small box. I find both perfect for storage. The rainbow sprinkles are a great assortment of colors, just like the product photo. They are also fresh and taste just as sprinkles should. Best of all, they arrived quickly and are a really affordable cost. I will absolutely be purchasing these Rainbow Sprinkles from Webstaurant Store again. In my experience and opinion, best place/way to purchase them! Such a great value! The colors of these jimmies are bright and cheerful. I love that there are no brown sprinkles included in the mix...that brightens everything up! These sprinkles are absolutely amazing! They are beautiful and I love the colors! I love the fact that there are two different colored greens. The only reason why this is not getting a five star rating is because when they came the bag was broken inside of the box. When I opened the box sprinkles went everywhere. It took me about 20 minutes to sweep all of them up . Other than that, I'm so happy I bought these!! I will definitely buy more!!! The product is just as described. The small 5lb box makes it convenient for my small donut business. This was the best price I found on the internet. This didn't receive a perfect score because while I like the product, the bag was broken open. I noticed sprinkles outside of the box these sprinkles came in. Other than that, I didn't have an issue. I use it in cake batter and on top of frosting's. These rainbow sprinkles are an excellent value. We use them as an ice cream topping and also have sprinkled them on freshly frosted donuts to finish them. Who doesn't want sprinkle on their ice cream sundae. I was going through so many I decided to buy in bulk. Great quality and price. I WILL continue to purchase these sprinkles, they are a great price and taste good too, I use them for cupcakes, cakes cookies, cake pops etc. The sprinkles are an excellent for baking or for a topping on frozen treats! The price is great and shipping was very fast. I highly recommend the product. Sprinkles? What else is so fun and so visually appealing? Delicious and fun for the kids, or just on ice cream, either way, yummy and affordable. Definitely can't beat the price for these sprinkles! Shipping was super fast. Have no complaints for this company, or their products. Will order again and again! Very nice product but package was handled roughly during shipping crushing most of the product but not a fault of the product great color and taste worth buying again. These add a rainbow of color to otherwise dull cakes, cupcakes, or ice cream sundays. I also love to stir them right into my cake batter for a fun colorful treat! Who doesn't love sprinkles? These are one of our best sellers as far as frozen yogurt toppings go. The colors are very bright. Will re order again. We love these rainbow colored sprinkles. 25# box. easy to use great flavor nice bright colors. Store in cool dry place no issues!! Would highly recommend. Another A+ product. These rainbow sprinkles are wonderful! They are soft and taste like fresh icing. Other sprinkles I have tried were hard and crunchy with no taste. I am so glad to have found these on webrestaurantstore! I will be re-ordering these. This is the best deal you will find on sprinkles anywhere! They are excellent quality and did not bleed on the buttercream icing I put them on. My daughters birthday was a sprinkle theme so I ordered 2 bags and used sprinkles for everything, even on the cups! I dipped the top of the cups in white chocolate and then in the sprinkles. The kids LOVED it!! I use these rainbow sprinkles in my confetti sugar cookies. They are good quality and taste just like brand name rainbow sprinkles-same as the ones you get in the tiny bottles from the grocery store for way more. These sprinkles are so pretty! The colors are bright and festive, love that the mix includes purples & pinks! The pricing is great also, we use them on cupcakes & cake pops. These are great a great tasting product. The cost savings to if I purchased locally is crazy. I purchase these six at a time to save on shipping. What's not to love about these rainbow sprinkles?! They are a great value for the price, and the perfect topping for ice cream and cupcakes! Rainbow sprinkles bring out the kid in us all. We've found that products like cupcakes or cookies with sprinkles on them sell more than without. This was the best deal I could find on these rainbow sprinkles. They have beautiful colors including pink and purple. They help make our donuts really appealing. We have ordered sprinkles through various distributors and found these to be of the best value and most eye appealing! They are big and bright and customers love them! These rainbow sprinkles are brightly colored, taste great and can be used on a variety of items. We use them on our cakes rolled in sprinkles and they don't smash and crumble. We just love these sprinkles on everything from ice cream to cookies and cakes. They also add a great little bit of extra to pudding cups as well. These rainbow sprinkles are a great bargain when you buy them in bulk. We typically use them for our cake batter truffles. They are perfect becuase they are a bright pop of color both on the outside and inside of the truffles. These sprinkles are a great value and add a bright burst of color to any of my chocolate baskets! I use them for so many different products! Add these sprinkles onto any baked goods, and they automatically look a lot more appealing and appetizing. The children love using them as sprinkles, and they're a bargain at this price! Who doesn't love a 5 lbs bag of rainbow sprinkles! It's also a fantastic bargain - for the same price, you can usually only find a small tub of sprinkles at my local grocery store. These are just as good if not better! I use a lot of sprinkles in my bakery, so a good bulk source is paramount. These are very colorful, tasty, and reasonably priced. Perfect for rolling in frostings. Great sprinkles they are very fresh and tasty and you get a ton of them for a great price. They are a big hit at ice cream bars at the schools. We use these sprinkles for so many things. I put them on sundaes and just about anything that has whipped cream on it. They are bright and colourful and really adds to the presentation. These are always a fan favorite. They are good for decorating cupcakes and topping ice cream cones. We use them for our weekly ice cream bar on Sundays. I really love the rainbow sprinkles. They are a great price for a great product. I use them to top cupcakes or cakes or even mix into batters. very colorful, and very good, long sprinkles, not small broken pieces , like others. 25 lbs, excellent for places where you sell a lot , and even for homemade sweets. These rainbow sprinkles make any dessert look better. You can put them on ice cream, cupcakes, cakes, and cookies to make them look more colorful. These Rainbow Sprinkles can be used for a lot of items in the baking and pastry industry. Ice cream, cupcakes, cakes, doughnuts, and frozen yogurt. This is a classic topper! It is great for ice cream and frozen yogurt! Great price for such a large case! I love to top cakes with them too!! They are great of kids. Kids loves them in cakes, cupcakes, ice cream and almost everything else. They are so cheap to purchase that i buy in bulk amount. Rainbow sprinkles are always a hit with the kids. I keep these on hand both for decorating cakes and to offer to the local children who absolutely love sprinkles on their ice cream. Great price for these as well! Definitely worth keeping on hand! These rainbow sprinkles are so classic! I love using them in sundaes, cupcakes and even on cookies or cake. They add such wonderful color to anything. These items have been used for business and personal usage and are delicious in taste and are beautiful on cupcakes, cakes and also ice cream. These sprinkles are wonderful. They are true to color. They're vibrant and look good on just about any color cupcake. They also taste pretty good.